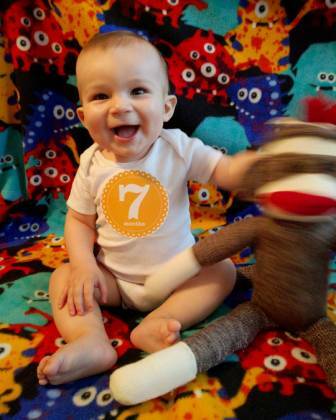 Dexter Ian is seven months old… well. He turned seven months on the 10th, almost a whole week ago, and this photo wasn’t taken until yesterday, and you have no idea how hard it was for me to admit those lapses that no one cares about except me. A couple of weeks ago, I sat in my doctor’s office, rigid with anxiety and actually said the sentence, “I am doing the best I can but I could do better.” You better believe she called me on my crap immediately. I’m working on it. Inhale. Exhale. Calm blue ocean calm blue ocean. Dexter likes silly dances (both watching and and performing), his antibiotics (touch of bronchitis this month), slapping his hand on whatever surface he can reach and babbling emphatically while Facetiming family far away. He’s at this really cool stage where he intently observes and you can practically SEE his little brain cells firing away while he soaks up his surroundings. We try to take Dex to as many new places as we can to encourage this. Maybe instead of calm blue ocean, that’s my mantra: show him the world, show him the world. If we keep doing that and loving him hard, I imagine the rest will fall into place.